How to order a meal or drinks for a resident ? If you have an excel file with your menu items and you want to import it into Cubigo, first open the Administrator's overview of the Dining cube in the side bar Dining | Items. Begin by downloading the dining import template. You can find it at the bottom of this article. Once downloaded open the file. 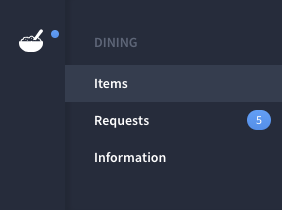 Items | How do I add a meal to the menu? Enter the information you want to import into the rows and columns and save the file. Only items with a value of "Published" or "Unpublished" in column 2: "status" will be imported. After uploading the import file, you can select the channels to which you want to broadcast this menu via digital signage.